Tic Tac Trance #050 Replay available! The replay of the latest episode of Tic Tac Trance is now available HERE and at Mixcloud.com/TicTacTrance! Happy birthday Tic Tac Trance! 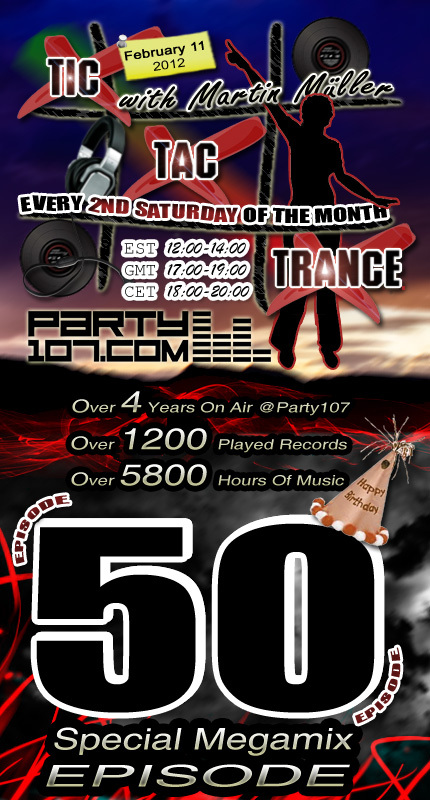 On February 11, 2012 episode #050 of Tic Tac Trance will air. After over 4 years on air presence, over 1200 played records and over 5800 hours of music, the anniversary edition of my radioshow is almost here! This episode will feature a special megamix of my favorite tunes in 4 years of Tic Tac Trance. A special thanks for faith goes to my radiostation Party107.com and Mark Kane, thanks for your support! My show airs TODAY at 18 CET / 17 GMT / 12 EST. Check out your local time HERE!